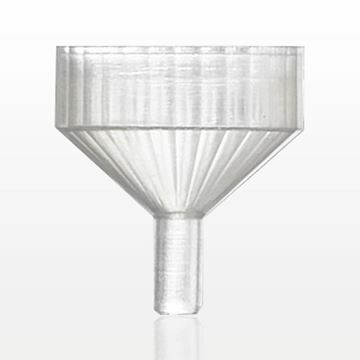 Easily pour liquids into containers with this frosted polypropylene 18 mm funnel. 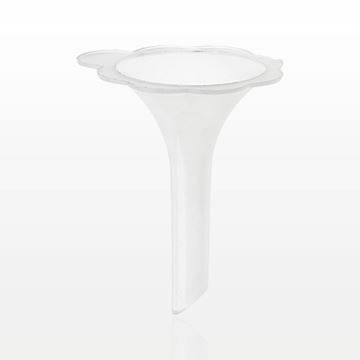 Use this small polypropylene funnel to help pour samples of your liquid formulas into sample bottles and containers. When accuracy is essential, our disposable funnels will ensure the precise filling of containers with liquids. 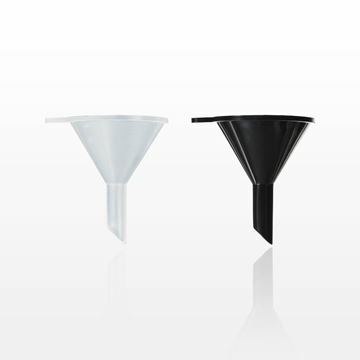 Funnels are critical for filling during the product development process, or even for use at the cosmetic counter when offering samples to customers. With a convenient funnel, spills and waste are prevented. The funnel stem is inserted into a bottle or vial that has a smaller opening or a narrower neck than the original container. We offer quality, single-use funnels at competitive prices in a variety of reliable plastic materials. The plastic disposable funnel offers a solution for filling a vial with fragrance or other liquids, while avoiding significant product loss. Liquids are easily transferred using our flower-shaped funnel, which is designed to stay in place as you pour. With our funnel opening and stem width options, you’ll be sure to have the right size funnel for your tasks. Products can be mixed and secured in your preferred containers, with less waste, when our versatile tools are on hand. Our goal is to simplify the ordering process of quality funnels in bulk. A useful funnel can be purchased with a tab design that keeps it securely on top of a container during the pouring process. Basic funnel designs are also available, with options for color customization. We have the best frosted funnels in various sizes to accommodate professional requirements. It’s easy to order wholesale funnels by the bag or bulk-packaged funnels by the piece. You’ll be ready to pour liquids effortlessly from measuring cups or jugs into other containers or smaller sample bottles. We invite you to experience our top-notch customer service when you shop for disposable funnels today.